I finally got my DAW up and working again over the weekend and had a little time to spend with the Serge Creature. Here's a quick demo of a single patch - no other M-odules/Panels were used, no multi-tracking and no processing other than a bit of reverb. Only the knob positions were altered to get different timbres. I recorded it as a wave file because MP3 was pretty weird sounding and a lot of the dynamic range of the original was lost. Its a little under 14mb so be patient. 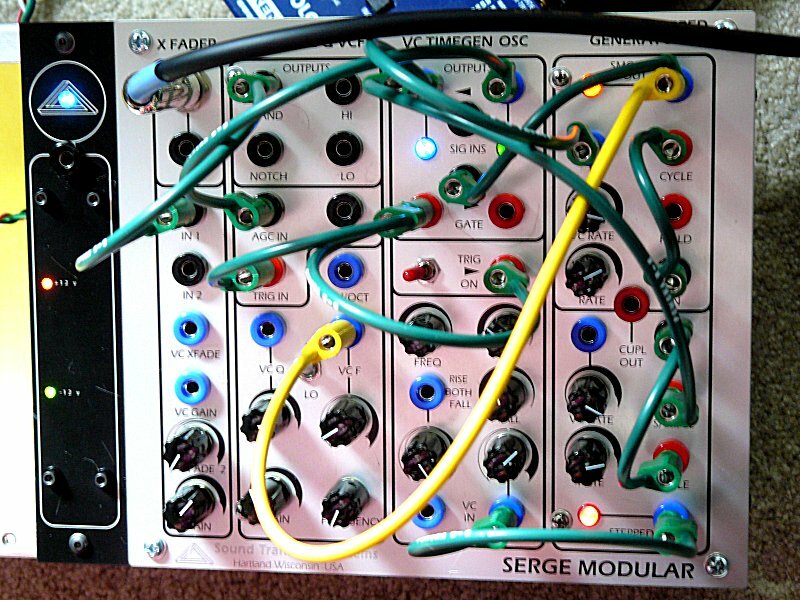 All sounds were created with the patch configuration shown in the photo. At this stage, I'm working on a self-generating rhythm patch now and will post it as soon as time permits. I'm really loving this little beast! As per usual, the title links to the full Creature website.